This thesis investigates monolingual and bilingual children’s understanding ofthe interaction between quantifiers and binding. The quantifiers that are examined in the present studies are all, each and especially every in Dutch and in English. The binding phenomena studied in this dissertation pertain to reflexives and pronouns and their antecedents. These antecedents are either referential NP expressions, such as the kangaroo, or quantified NP expressions, such as every sheep. A new explanation is presented to convey monolingual Dutch and English children’s behaviour on binding tasks. Whereas the standard binding account can only partly explain English children’s performance, the current explanation can account for both the English children’s and the Dutch children’s performance. Monolingual Dutch children are revealed to have a distributive interpretation preference of the quantifiers, while English children prefer the collective reading of every. The present thesis shows that their diverging quantifier preferences affect their binding performance on sentences containing local quantified NP antecedents. This new explanation also holds for bilingual children. 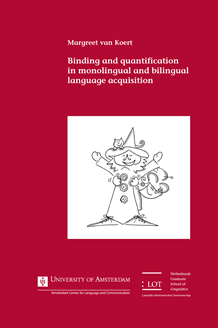 The studies conducted in this dissertation found that English-Dutch bilingual children differ from their monolingual peers regarding their quantifier interpretation preferences. In line with the proposed explanation, these bilingual children also behave differently from their monolingual peers with regards to sentences containing local quantified NP antecedents. Thus, this thesis shows that there is an interaction between children’s understanding of binding and their preferential quantifier interpretations.